Sergei Alexandrovich Yesenin, whose name is more often spelled as Esenin, was a well-known and popular Russian lyric poet of the 20th century whose life was tragically cut short at the age of only 30. He was born on the 3rd October 1895 in the small village of Konstantinovo which lies in the Ryazan Governorate of Russia. His family were poor peasants and Sergei was mostly raised by his grandparents. They encouraged him to write and he was writing poetry at the age of nine, already having developed an interest in the old stories of Russian folklore. By the age of 17 he was working as a proof reader for a company in Moscow and he decided to supplement his education by enrolling at the Charnyavsky University in the city. As an external student he remained there for eighteen months. His literary life really began following a move to Petrograd in 1915 and here he sought out the society of established poets such as Andrei Bely and Sergey Gorodetsky. Another writer, Alexander Blok, acted as a mentor to Yesenin and was instrumental in furthering his career. He learned well from his compatriots, taking advice where he could on the construction of poetry. In 1916 his first collection of poems was published under the title Radunitsa. This, and other work, featured simple themes such as love and family life. Darker days were ahead though as he found himself conscripted into the Army along with millions of other Russians. His service lasted from 1916 to 1917, when the October Revolution swept away the old Tsarist rule and took Russia out of the horrors of the war. At first Yesenin was a great supporter of the new order but soon became disillusioned. He often risked his liberty by openly criticising the Bolsheviks with his writing, an example being The Stern October Has Deceived Me. Yesenin formed his own publishing company in 1918 – the Labour Company of the Artists of the Word – and from this the new Russian literary movement of imaginism was born. 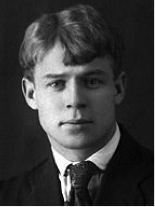 Although busy with his writing commitments, Yesenin remarkably found the time and energy to marry several times, with a number of children coming from his first two. His third marriage, in 1922, was to the famous American dancer Isadora Duncan but, as before, this relationship was short-lived. He toured Europe and America with his new wife who was eighteen years old than him but, by the Spring of 1923, Yesenin was back home in Moscow. Another relationship started that same year but did not result in marriage although they did have a child together. A fourth wife was soon on the scene though when Yesenin married Sophia Andreyevna Tolstaya, one of the granddaughters of Leo Tolstoy. Alas, his life was starting to unravel and there were frequent reports of heavy drinking sessions leading to periods of police custody. Yesenin was found hanged in his hotel room, an apparent suicide brought on by depression. He had spent time in a mental institution and had escaped shortly before his death. Theories soon circulated though that he had been murdered by NKVD agents instead. The fact that much of his work was banned by the Kremlin in the years that followed supports the notion that, while he was a very popular poet in Russia, he was not well thought of by the authorities. Despite this he received a state funeral and his grave is topped by an elaborate marble statue. Sergia Aleksandrovich Esenin died on the 28th December 1925, aged 30.